Over time, ovens can become very dirty if they are not cleaned on a regular basis. This is usually the case when a strong, distasteful smell is emitted from the oven as it heats up. Cleaning a dirty oven can be difficult, especially if it hasn't been cleaned in a long time. Fortunately, there are a variety of things that can help to ensure your oven looks and functions its best. Cleaning your oven is an essential home maintenance task. There are a variety of products available that can be used to clean the inside of your oven. Most of these fall under the category of degreasers, and are used in ovens that do not have a self-cleaning feature. While effective, degreasers are often quite toxic and can be dangerous to use if you don't take proper precautions. Always wear gloves and ensure that proper ventilation is in place when cleaning your oven with a degreaser. Self-cleaning ovens are relatively easy to clean. 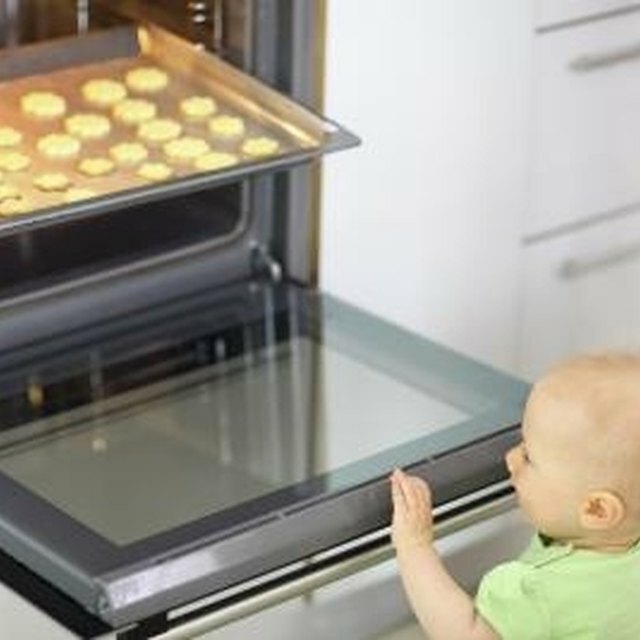 Rather than requiring the use of degreasers, self-cleaning ovens heat up to an extremely high temperature and literally burn the food residue off. To use the oven's self-cleaning mode, remove the racks, lock the oven door and turn on the self-clean function. Depending upon your oven model, self-cleaning will generally take between two and six hours. After it is finished, allow the oven to cool and wipe it down with a damp cloth to remove any excess residue. When cleaning an oven, it is important to clean the exterior as well as the interior. Usually, a mild soap solution or glass cleaner can be used to clean the exterior of an oven; avoid using an abrasive scrub pad, which can scratch the oven's exterior. Instead, use a soft sponge along with the cleaning liquid of your choice. When it comes time to fully clean your oven, the process will be far easier if you have been proactive each time you've used it. If food or liquid spills out into your oven while you are cooking, be sure to clean it up as soon as the oven cools. Otherwise, it will cake up and present a challenge when you finally get around to cleaning the oven.